Public art is a wonderful thing and installing more of it is always to root for. The kind you invest in and where you install it will however tell a lot about what the public and public policy makers value. Here, we value enjoying public art from our car. If you would tour through Finland’s towns and cities by car, you will notice that we have put a lot of effort in making your drive a pleasant one. Just about every roundabout you meet will be decorated with an installment of some sort or at least with nice plantings. Not to mention larger art installments freeway-side or on crossing bridges. In inhabited areas, we will also make sure the grass next to the roads and ramps is nice and tidy. 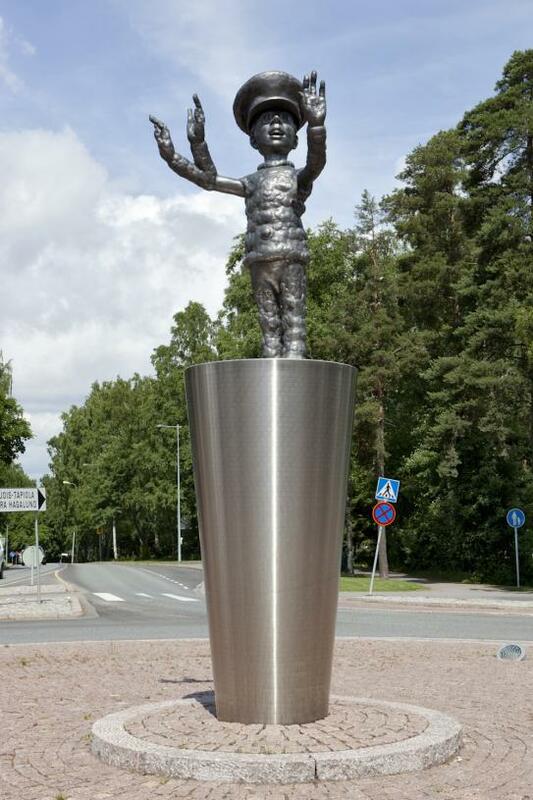 The Art Police in a roundabout in Espoo. Picture taken by Ari Karttunen. While all of this is fine per se, it also reveals how far we are from a mindset that would embrace walkable neighborhoods and public transportation. The flip side is that we pay little attention to public art – or the public realm at large – in places where people generally live, walk and go about their business. Especially in smaller towns or the areas outside of the inner neighborhoods of larger cities it could be difficult find any piece of public art besides the one installed in the middle of a roundabout. Yet, these are the areas where the majority of Finns live. In many places you will also discover that the best place to go do something that requires a larger grassy area would be the grass next to the motorway. The neighborhood park is likely to be an area that was just left unbuilt. Apart from maybe some jogging paths and a sign that claims the area as a park. The closest public planting display is at the roundabout. Besides art, also nature can be enjoyed through a windshield. The city of Tampere is working on diverting a busy four-lane thoroughfare into a tunnel that separates the center of the city from a lake (a topic for a future post). The goal is to free land for expanding the inner city and give residents access to the lake. The initiative has however generated a lot of opposition. And of course one the fundamental arguments for opposing the project is that passing drivers would lose their view of the lake. It seems like in Finland we consider one of the most natural ways of enjoying public art, plantings or even nature is while sitting in a car. We need to understand that the lake is not going anywhere, you just need to make the effort of getting out of your car to enjoy it. Interesting topic. I searched for the modal share of your biggest cities and found out that the statistics aren’t too bad in comparison to other European cities.. You only should cycle more! How come that Turku has such a low share of car transport? I have a feeling these statistics only take into account the numbers of the core city.. But for example in Helsinki you should also take into account the inhabitants of the suburban cities around it and beyond. In Helsinki we actually have surprisingly good public transportation even though the majority of the city is suburban. But it would be interesting to see a comparison of the cost-effectiveness of public transport in European cities. I have a hunch we spend a lot of money per transit user. And with Turku the numbers must be mixed, because there is no way that would be possible. nice post 🙂 in israel we also have a nice art on roundabouts, however its really depends on the city’s municipality. if its a city who cares about art and nature, they will build nice roundabouts as well. in my city they have no taste whatsover…i am not sure that view of roads from the car is an issue in israel. they rather build a faster and a bigger road then thinking about the view. its also very sum up to money and costs.